On the 23rd of August 1958, the country’s “forgotten” race riot unfolded on the streets of Nottingham, England. This culmination of simmering tension, sparked finally over opposition to interracial romance, was a pre-cursor to the mass violence that followed a week later in the London district of Notting Hill. Similar to many contemporary industrial cities, the post war economic boom that Nottingham had enjoyed was coming to an end by the mid-1950s. The brief period of prosperity, which had been an incentive for Caribbean migration to the United Kingdom, had ended. There were few jobs and many potential employees creating a competitive job market for the 2,500 West Indians and 600 Asians who had been absorbed into an already saturated city. The battle lines drawn in this atmosphere were often racial. Indeed, some black employees were denied work in Nottingham’s factories. By the end of the summer, resentment had reached its peak and an incident in a pub in the St. Ann’s district acted as the catalyst to previously suppressed brutality. Eyewitness accounts differ in their memory of exact events, but all place a racially mixed relationship at the centre of the evening’s troubles. A West Indian man, boyfriend, suitor, or potential partner, was seen enjoying a drink with a blonde British woman. This symbolized the belief many held that the immigrant community was seizing the opportunities that should be reserved only for the country’s domestic citizens. The young man was assaulted and soon a crowd of over 1,000 had gathered in the area. Violence lasted for many hours and comprised attacks between the white and black male communities. Eight people were reportedly taken to the city hospital; one man required 37 stitches following a wound to the throat. The local newspaper, the Nottingham Evening Post, wrote that “the whole place was like a slaughterhouse.” A special police force patrolled the streets of St. Ann’s for a while after the riot. A week later crowds gathered again. There were very few black people present and, confusingly, the predominantly white mob turned on itself. The authorities were reluctant to acknowledge the Nottingham events as being racially motivated. The Chief Constable at the time, Captain Athelstan Popkess, dismissed claims that the rioting was caused by prejudice. The Nottingham Constabulary published a report as late as 1989 that blamed generic hooliganism for the violence. Despite this ignorance, there is not an entirely negative legacy of black experience in the city. Eric Irons, an integral figure in community relations after the riot, in 1962 became the country’s first black magistrate. Likewise, Viv Anderson, born in Nottingham, became the first black soccer player for local team Nottingham Forest and later repeated the accolade at international level when he represented England in 1978. 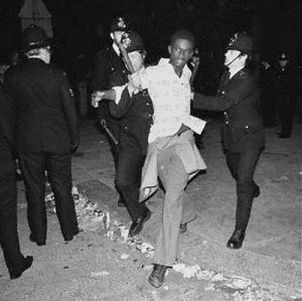 The ‘Forgotten’ Race Riot, by Linda Pressly: http://news.bbc.co.uk/1/hi/uk/6675793.stm; Bygones: The race riots 50 years on: http://www.thisisnottingham.co.uk/news/Bygones-race-riots-50-years/article-306378-detail/article.html.